I don’t buy salmon very often even though it is really good for you and I love the flavor. The fact is that, in my opinion, farm-raised salmon has some ethical issues and it just doesn’t taste that good. I hold out for the wild-caught salmon, but the problem is that most of the time it is just too expensive to buy enough for a meal for the three of us. If I can catch it on sale at the fish market and it looks good, then I will make the investment and get some. 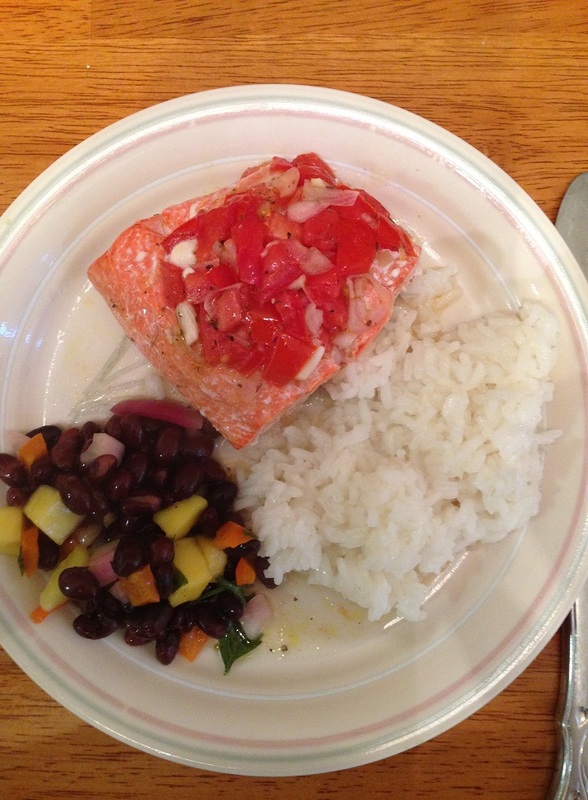 This was the case last week when I came across some wild salmon for $14 a pound, a lot cheaper than the usual $19 a pound or more, so I decided to get some and make it for dinner that night. 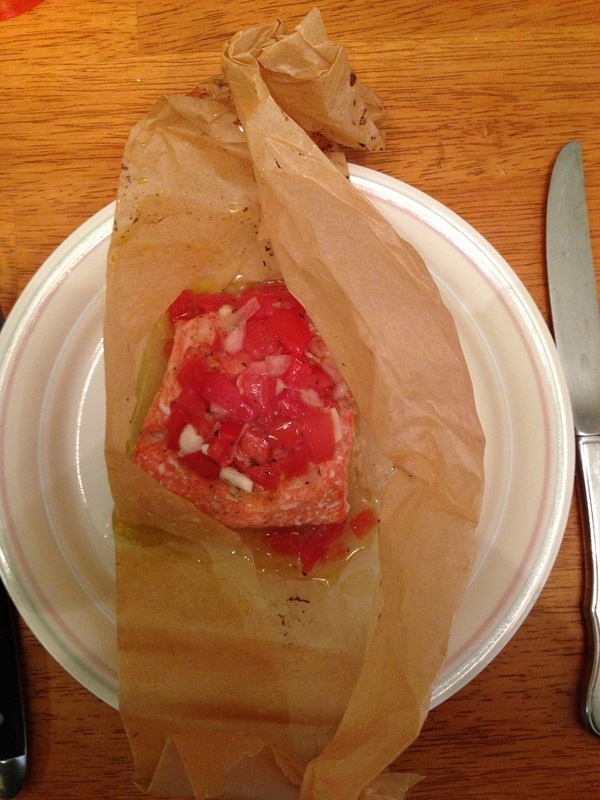 I found this simple recipe from Williams-Sonoma for salmon baked in paper and decided to give it a try. The recipe calls for 6 portions, but I simply cut the recipe in half and made it for the three of us. Preheat the oven to 400 degrees. In a small bowl, stir together the chopped tomatoes, shallots, marjoram or oregano, lemon juice, the 2 tablespoons of the olive oil, salt and pepper. Rinse the fish and pat it dry with paper towels. Cut 6 pieces of parchment paper into about 12 inch squares. Fold each sheet in half, open the paper like a book and brush the paper to one side of the crease you have made with olive oil. Place a salmon fillet on each oiled side of the paper. Spoon the tomato mixture over the fish, dividing it evenly among all of the packages. Fold the parchment paper over the fish. Tightly seal each package by folding the edges over several times and creasing the paper firmly. Place the packages on 2 baking sheets. Bake the packages in the oven until the salmon is opaque throughout, about 15 to 17 minutes. To check for the doneness of the fish, carefully open a package and pierce the fish with a knife. Slide the packages of the fish onto individual plates and allow the diners to open their own packages individually. It is a very simple dish that comes out with great flavor, especially this time of year when you can use fresh, local tomatoes as part of the meal. It is an easy combination and the fish is cooked to perfection, cooking in the paper just right with all of the flavors sealed in. I think you could do the dish with any type of fish that you like and just adjust the cooking time according to the thickness of the fish you are using. All in all, it is a very easy and elegant dish you can make any night of the week. I served this with some white rice and some of the black bean and mango salad I had. Betsy – I can’t see any difference really between “en papillote” and this recipe, other than maybe they wanted a different name for it :). I think just about any fish would be great to do this with and I agree, tilapia is much more affordable than the salmon! Thanks for the comment and thanks for liking the post!